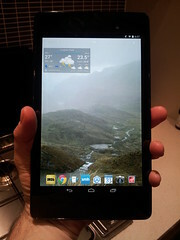 I bought my partner the latest version of Google’s Nexus 7 for chrissy. Over the last couple of months I have watched it in use and played with it myself. This thing is light and cute and fast and cute. Really. At that point, I was using my Transformer Prime mostly in tablet mode though I was finding it a little on the heavy side for reading the SMH in bed. I thought a new tablet might be in order and had a look at the smaller ipads, figuring it had been a while since I bought an apple :-) I didn’t mind them but they didn’t impress particularly and just didn’t look as cute as the nexus. So a couple of weeks ago I bought a nexus for me, having checked staticICE for a good price. The nexus has rarely been out of my hands since. It is the best tablet I have ever used; it’s fast and the screen looks fantastic. It’s light in my hand and all my usual apps are running well. The size is just about right too, though I think slightly smaller might be even better. Battery life is fab and it’s always close to hand so I’ve been picking it up for casual reading every other moment. It’s been a long time since I read the SMH* on a daily basis but now I’m downloading it via the app every morning and having a browse throughout the day. When setting up the nexus I used the restore option from my gmail account which meant all the stuff I used on the tablet and the phone, both android, were automatically loaded on to the nexus, and importantly that included their settings. Wifi access is fantastic. There are spots in the house which I thought were unreachable on the house network but the nexus still manages to get a bar of connectivity. One of those spots is the bed. With the previous tablet, I used to use my phone as a wifi hotspot to download the papers, whereas the nexus is fine. I’ve even bought some games…I came across a mention of an interesting game called The Room and paid a huge 99 cents for it. Very, very addictive. It’s a puzzle game though not excruciatingly hard. Atmospheric with a strong steampunk oriented look and feel. Satisfying. I have since paid $3 to buy The Room Two which I’m now in the middle of. * I recently bit the bullet and took out a subscription to the digital edition of the SMH. I now have it installed on all my devices across mac, PC, and android.